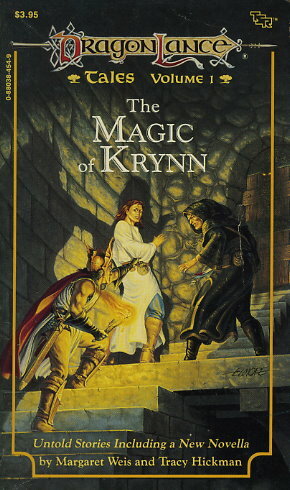 The answer lies in the new DRAGONLANCE novella by Margaret Weis and Tracy Hickman, which gazes into the future of Caramon and his mage-son, and into the dark nether-past of Raistlin. Tales of sea monsters, dark elves, ice bears, hideous hydra-headed serpents, and loathsome draconian troops. Further adventures of the kender Tas; the innkeeper Otik and young Tika; the dwarf Flint and Tanis, leader of the companions; Caramon and Raistlin, twin brothers, one, a genial warrior, the other, a sickly magician and scholar. Nine short stories by superlative writers, plus an exciting new novella by Margaret Weis and Tracy Hickman.